Ultimately, the solar magnetic field powering all manifestations of solar activities draws its energy from various plasma flows within the solar interior. One of the most important such flow is thermally-driven convection pervading the outer 30% in radius of the Sun. The interaction between this flow, and the ambient magnetic field, is described mathematically by the magnetohydrodynamical equations, a set of complicated coupled nonlinear partial differential equations. The only way to calculate the time evolution of the variables characterizing the solar magneto-fluid is by numerically integrating the MHD equations. Even then, such simulations can cover only a limited range of spatial and temporal scales, due to limitations in present supercomputing capabilities. Working in close collaboration with Dr. Piotr Smolarkiewicz (NCAR, Boulder, USA), we have developped a new global anelastic MHD simulation code, called EULAG-MHD, starting from the popular and powerful hydrodynamical simulation code EULAG. In our numerical experiments, the main purpose is to investigate features and mechanism involved in the cyclic regeneration of the solar dynamo. We therefore study a global model defined over a thick, rotating spherical shell domain spanning from 0.6 to 0.96 solar radius, thus covering the bulk of the convection zone as well as the outer portion of the inner radiative core. The numerical experiments reported upon below were obtained at a low to moderate spatial resolutions (128x64x47 or 256x128x96 in longitude, latitude and radius, respectively). Most of our simulations are carried out on the supercomputers of the Réseau Québécois de Calcul à Haute Performance. The GRPS Image Gallery offer many pictorial representations and more detailed descriptions of these simulations. The animations below show, over a short timespan, the spatiotemporal evolution of the fluid temperature (left), and of the radial components of the vertical flow speed (middle) and magnetic field (right) on a spherical shell located two grid points below the surface. The convective flow is organized in large cells with upflows in the center and downflows at the edges, with the magnetic field concentrated in a "network" of interconnected downflow lanes. Note the high degree of correlation between temperature and vertical flow speed, the prograde drift of flow and field structures associated with the zonal mean flow, and the vertically elongated, aligned flow structures in the equatorial regions, all characteristic of thermal convection in a rotating, stratified spherical shell. Although this simulations produces intense magnetic fields, here very little spatial organisation is apparent on large scales. Figure 1: Mpeg animation (12 MB) spanning 8.3 years in a representative EULAG-MHD simulation of solar convection. Left: temperature perturbation (-1.84 to +1.84 degrees K from dark to light); center: radial flow speed (-8.7 to +8.7 m/s from dark blue to light yellow); right: radial magnetic field (-0.013 to +0.013 tesla from green to yellow, gray is zero). All three satellite projections are extracted in the subsurface layers (r/R=0.945). The viewpoint is 30 degrees above the equatorial plane. In the solar context, the grand challenge with these types of simulations is to produce a magnetic field well-organized on large spatial scales, and undergoing regular polarity reversals on a decadal timescales. We have recently succeeded in simulating two distinct types of such magnetic cycles. Figure 2 shows the evolution of the toroidal component of the magnetic field generated in one simulation. Part (A) shows a Mollweide (longitude/latitude) projection on a spherical shell located immediately beneath the core-envelope interface, while part (B) shows a zonal average of the toroidal component plotted in the meridional plane. Strong, spatiotemporlly intermittent magnetic fields are still present beneath the convection zone, due to convective overshoot from above. Despite these strong fluctuations, a large-scale magnetic component is clearly apparent, antisymmetric about the equatorial plane and peaking at mid-latitudes slightly beneath the core-envelope interface (dashed circular arc on Fig. 2B). This "long" cycle has a half-period of about 40 years, with magnetic polarity reversals occurring synchronously across hemispheres. (See also the Page Solar cycle modelling). Figure 2: Mpeg animation (52 MB). Evolution of the toroidal (zonal) magnetic field component. Part A shows a Mollweide (longitude/latitude) projection on a spherical shell located slightly beneath the base of the convective envelope (r/R=0.71), while part B shows the zonal average in a meridional plane. Color coding as on Fig 1C, with the field strength measured in tesla. This simulation segment spans 81 years, in the course of which two polarity reversals take place. Figure 3 shows a second type of magnetic cycle, this one spatially localized in the low-latitude portion of the convective envelope. The Figure is identical in format to Figure 2, but the Mollweide projection is now extracted in the middle of the convecting layers, at r/R=0.88. The toroidal field is now markedly non-axisymmetric, but zonal averaging nonetheless reveals a substantial axisymmetric component undergoing poleward propagation in a mamner reminiscent of classical dynamo waves in mean-field electrodynamics. Here this "short" cycle has a half-period of about 5 years. Figure 3: Mpeg animation (10 MB). 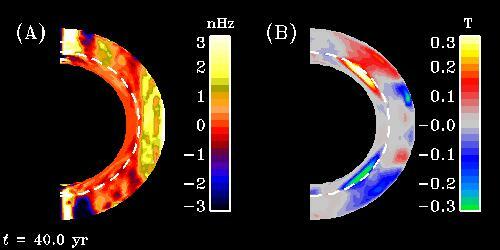 Evolution of the toroidal (zonal) magnetic field component in the middle of the convection zone. Part A Here the toroidal field is concentrated at low latitudes, and is markedly non-axisymmetric. This simulation segment now spans only 10 years. The "long" magnetic cycle produces an axisymmeric component exhibiting a strong spatiotemporal coherence. The magnetic force associated with this magnetic field drives a torsional oscillation superimposing itself on the mean differential rotation, varying in phase with the magnetic cycle but at twice its frequency, as shown on Figure 4. In its overall amplitude and phase, this pattern is remarkably similar to that inferred inside the sun from by helioseismology. Figure 4: Mpeg animation (37 MB). Rotational torsional oscillations in the MHD simulatio of Figure 2. The rotational frequency is temporally averaged, and this average subtracted from the rotation profile, yielding the time-evolving residual plotted in (A). This residual exhibits coherent oscillations with amplitudes of a few nanoHertz, at twice the frequency of the magnetic cycle (in B). One particularly interesting feature present in these MHD simulations producing magnetic cycles is the cyclic variations of convective energy transport caused by the associated time-varying magnetic force. As shown on Figure 5, the convective luminosity in the middle of the convection zone varies in phase with the magnetic cycle, namely it peaks when the magnetic cycle peaks, and is lowest at cycle minima. This is the same phase relation as observed between the total solar irradiance and the solar magnetic activity cycle. These results suggest that part of the observed irradiance variations on decadal timescales could be due to a deep-seated magnetic modulation of convective energy transport. Figure 5: (A) Time series of the convective luminosity (yellow) and magnetic energy (red) in the MHD simulation of Figure 3. Both sequences had their temporal mean subtracted, and were respectively normalized by the solar luminosity and pea value. The convective luminosity, measured here at mid-depth in the convection zone (r/R=0.88), shows a statistically significant positive correlation with magnetic energy.